Late November 1991, my father was on a business trip. He usually got me something from his trips; sometimes a souvenir or sometimes a game. On this particular occasion, he asked me what I wanted him to bring me. I told him I wanted the Game Genie for the NES. For some strange reason, he came back with Final Fantasy II (IV) for the SNES. That night, I put the game into my console and was wowed beyond belief. Best mistake he’s ever made. And so began my fascination with JRPGs. On March 11, 1995, Square (Square-Enix now) released what I consider to be the pinnacle of JRPGs on the SNES. Chrono Trigger would forever stay with me as one of my all-time favorite games. It excels in absolutely every category: story, graphics, music, gameplay, etc. Plus it has a lot of replay value. And it introduced something I had never seen before, which many other developers have since copied, New Game+. Chrono Trigger forever changed the JRPG landscape for me, and few games can even try to compare. Chrono Trigger has one of the most unique stories in any video game. It was fresh back in 1995 and it still holds up fantastically today. The game starts off with our protagonist, the silent hero Crono. He’s just your typical, overly muscular teenager hailing from the Kingdom of Guardia in the year 1000A.D. He goes off to the kingdom’s first Millennial Fair, and runs into an impetuous girl named Marley. She joins Crono for the rest of your day at the fair and even accompanies him to his crazy inventor friend Lucca’s demonstration of her new teleport machine. Crono volunteers to try it out and it works. Then Marle wants to join in on the action but, when she tries it, the machine malfunctions and she is sent back through time. Lucca and Crono decide to go after her, and that’s when this amazing time traveling adventure truly starts. Along the way, you’ll meet various other characters besides Marle and Lucca, who will join you in your adventure. There’s Frog the...well...umm...Frog. He’s an anthropomorphic frog who also happens to be a valiant knight. There’s Robo, the...umm...Robot from the future (seriously, these names couldn’t be any more generic if they tried….or maybe there’s a reason they’re generic...hmmm). In prehistory, you will meet, Ayla, the cave girl, who can fight with the best of them, even though she only uses her fists and legs. And finally there’s….well, let’s leave that one as a surprise for all four of you who haven’t played this game yet. The story and writing in this game are amazing. There are so many surprising moments in this game that will make your jaw drop. For example, the death of the main character, midgame, was a surprise that blew my mind the first time I played this game. There are also some very sad or sweet moments in this game that will have you reaching for tissues, such as when Robo is rejected by his “brothers” for being defective, or when you find out why Lucca becomes a tech-expert. Also of note, the game has a new translation which is a great improvement over the original, although I really miss one line concerning Lucca’s glasses near the beginning of the game. The graphics in Chrono Trigger are beautiful. The old-school 16-bit sprites still hold up today. It actually looks like a Dragon Ball Z RPG, and for good reason. The artist who drew up all the characters in this game is none other than Akira Toriyama, creator of Dragon Ball Z. In fact, if you introduced characters from either universe into the other, they would fit in nicely. 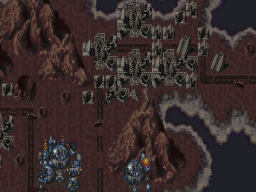 Like a lot of old school RPGs, the overhead graphics in the map are different from the in-battle sprites. 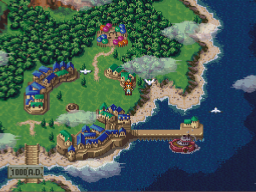 However, you spend very little time in the overhead map, unlike other old school RPGs, since you enter the points in the map that then become the actual play areas. The little girl with the red hair? That's Crono. The various eras in the game look completely different. The eras that most resemble each other are 600A.D. and 1000A.D. because of the closeness in time. Even so, 600A.D. looks very dark and dreary while 1000A.D. looks very bright and friendly. Other future and past eras are completely different, even in topography. There are some beautiful uses of Mode 7 in the game. This SNES feature is used in some battle scenes for added flair, or even when you’re just traveling through a time gate. And speaking of beautiful, the backgrounds in this game are simply stunning. There are some, such as the courtroom scene that will make you forget that you’re looking at an 18 year old, 16-bit game. We are about to embark on a most excellent adventure!!! There are some new animated movies that accompany some scenes in the game. There are 10 in all. They were originally made for the playstation re-release and adapted for the DS. They are extremely well done and complement the game well, giving it a more modern feel. I do have two complaints about this new addition. First, the movies play right before the same event takes place in-game. So basically, you’re viewing the same scene twice, once in anime form, and once in sprite form. Second, the volume for the movies is lower than the volume for the game. All you had to say was "No, thanks. I don't want to go out with you." Marle can be such a drama queen. The only complaint I have about the graphics is that they are exactly the same as the SNES game. While the game still looks absolutely stunning, I wish the game had been given a fresh coat of paint, like in other remakes such as The Legend of Zelda: Ocarina of Time and DuckTales Remastered. The music in Chrono Trigger is absolutely amazing. This is one of the best gaming soundtracks ever made. This should come as no surprise, since the soundtrack was composed by Final Fantasy’s former composer extraordinaire, Nobuo Uematsu. It’s hard for me to pick favorite songs, since the entire soundtrack is fantastic, but I’ll give it a try. The Main Theme is spectacular and really sets the mood for the game from the very beginning. Memories of Green, the World Map Theme for 1000A.D. is extremely beautiful. Guardia Castle is really cool and it only gets better as it goes. Frog's Theme is one of the coolest theme songs ever composed. Wind Scene, the World Map Theme from 600A.D. sounds melancholic and regal at the same time. Ayla's Theme is really cool and really pumps you up for battle. Confusing Melody, the background “music” in Magus’ Castle is really creepy, especially with that laughing baby. Decisive Battle with Magus is a really cool piece. Rhythm of Wind, Sky, and Earth, the 65,000,000B.C. Map Theme is extremely catchy. At the Bottom of the Night, is such as sad but beautiful piece. At the Corridors of Zeal is one of my favorite songs in the game. World Revolution is an awesome boss song with some nice effects and it’s follow up, Last Battle, is even better. To Far Away Times is one of the greatest credit songs ever composed, especially when it switches up near the 2:40 mark. A special mention goes to Robo's Theme which sounds a lot like Never Gonna Give You Up by Rick Astley. The gameplay in Chrono Trigger starts off like a traditional RPG. 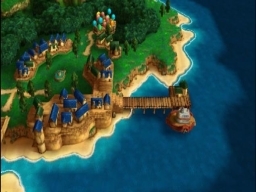 You move on a map screen and enter areas such as towns, caves, and castles. However, you’ll find out how different this game is as soon as you enter a battle screen. The enemies appear on the screen and you can avoid running into them, for the most part. So, this does away with random battles. Once inside a battle, your position on the screen, relative to enemies, is very important. It determines how and if some Techs (magic) will hit. For example, there are some techs that can only hit multiple enemies if they are standing on a horizontal or diagonal line. Others, require that you’re near the enemy for the tech to hit. All of the battles are set to an Active Time Battle system, in which you choose one action for a character once his personal timer is full. Enemies also have a personal timer. You can turn off this feature by putting the game in Wait Mode. As the characters fight together and learn the requisite Single Techs, they learn Double and Triple Techs. Double Techs are techs that are performed by two characters. For example, Crono and Marle can perform Ice Sword, an attack where Marle freezes Crono’s sword which he then uses to strike an opponent. The Master of War takes an Ice Sword to the face. Triple Techs are even cooler. Three characters can come together to perform a Tech uniting all of their skills. For example, Delta Force unites Crono, Marle, and Frog’s Elemental Magic to deliver a devastating elemental blast. Speaking of Elements, each character (except for one) is naturally aligned to a particular element. These are Lightning, Water, Fire, and Shadow. One of the coolest aspects of the game is New Game+, which is accessed by beating the game once. You can begin a new game with all your levels and Techs intact, and most of your equipment. It also grants you to access the games multiple endings, of which there are 13. As for the new elements in the DS Port, you can play the game in Classic Mode or DS Mode. In Classic Mode, all the UI elements appear on the top screen, like in the original. DS Mode clears up the clutter and switches all the menus and messages to the bottom screen. It also allows you to control the game with a stylus. The extras mode gives you access to all the movies, music, bestirary, etc., in the game. The movies can be disabled so you don’t have to view them in-game. The Arena of Ages, is a new area accessed through the End of Time. In it, you train a little creature and send it to battle other creatures. You can win items that don’t appear in the game itself. I found it to be a waste of time and no fun at all. I gave up on it after a few battles. Don't waste your time in here. Lastly, after you beat the game, you can access three new random dungeons called the Dimensional Vortex. After beating all three dungeons, you can fight a “new” boss and see a new ending which links Chrono Trigger & Chrono Cross. Chrono Trigger is one of my favorite games of all time. I play it every once in awhile and I never get tired of it. To this day, I have not seen all the endings, so I still have new stuff to see, even after all these years. Chrono Trigger DS is the definitive version of this game. It has an excellent translation and loads of extras which make the game better, for the most part. A part of me would have liked to see updated graphics in this version and better thought out new sections but, it is nothing that greatly affects the end product. When the guards are chasing you outside of Guardia Castle, their dialogue is a reference to Final Fantasy III’s ghosts inside the Phantom Train. In the North American version, the three bosses that you fight in Ozzie's tower are named after famous musicians. these are Ozzy Osbourne from Black Sabbath, Slash from Guns n Roses, and Flea from Red Hot Chili Peppers. There is even an NPC that states "they're tone-deaf, evil fiends." Norstein Bekkler's laugh is the same as Kefka Palazzo's laugh from Final Fantasy 6. 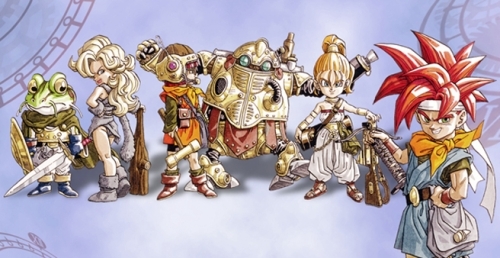 Akira Toriyama's promotional art for Chrono Trigger was based on beta screen shots of the game. After beating the game you have the option to replay using everything you acquired through your first play through. Using this to beat the game's main villain at the very beginning of the game will unlock a secret ending where you meet the game's developers at the End of Time. There have been two non-profit fangames which received a substantial amount of coverage that were ultimately shutdown by SquareEnix. The first was Chrono Resurrection, a 3D remake of the original for PC, Xbox, Gamecube and the Nintendo 64. The second was Chrono Trigger: Crimson Echoes, a ROM hack of the original game which served as a sequel set five years after. Both projects were stopped in 2004 and 2009 respectively, after receiving a cease and desist letter from SquareEnix. An alpha version of Crimson Echoes has since been leaked online. In the Hunting Range in Prehistory, it is possible to attack the Nu as the rain is going away to get his drop items without having to battle. Crono is the only character totally confirmed to be left handed. Crono has no dialogue in the game (although in one ending he has a few lines of dialogue). Crono is a condensed form of Chrono, a Greek prefix for time. Since Crono is the lead protagonist in a time-traveling game, this name is very appropriate. Crono closely resembles the hair of Gohan at his pre-teen years. Dragon Ball creator, Akira Toriyama, drew this character, along with everyone else. Nadia is a common name in several languages: in Bulgarian and Russian it means "hope", and in Arabic it means "virtuous" and "gentle"; her adventuring outfit also bears a resemblance to Arabic clothing. Marle means "pleasant wood" in Old English. Both mirror her kind and friendly disposition; the latter may be a reference to her place of residence, which sits beyond a forest. Lucca is a city of northwest Italy west of Florence. On the site of an ancient Ligurian settlement and a Roman colony, it became a free commune in the 12th century and was later an independent republic. It's one of Italy's most conservative and richest cities. Lucca is also the root of many light-oriented words, such as luminescence. This is likely a reference to her bright personality. Also, Lucca's name may be an adaptation of Lucia, which was the name given to a Catholic Saint who is titled "Healer of the Blind". This is appropriate as Lucca saves her mother from becoming crippled and she opens an orphanage for misplaced children. Frog's Japanese name Kaeru is a pun as this can be read both as "frog" (蛙) or the verb "to transform, to change" (変える). In addition, Ozzie's comment about Glenn's inaction after Cyrus falls is, in Japanese, that he looks like a "frog glared at by a snake" (a Japanese idiom largely equivalent to North America's "deer in the headlights"). Thus he is transformed to match the idiom. In the English translation Frog speaks in a grandiose, semi-Shakespearean manner, using words such as "thou," "thee" and "shalt," though strangely no one else from his era speaks that way—including Frog himself when shown in flashbacks as Glenn. It's interesting to note that in the Japanese version, he does not speak with the Middle Ages accent, and instead talks rather rudely (often cursing). Frog's old English speaking style has been removed from the DS port and adheres to his original speech in the Japanese version, though rather more formal and polite. As with Atropos XR, his mechanical lover, Robo was named after a figure in Greek Mythology. Renowned for his mischievous intelligence, Prometheus the Titan stole fire from Zeus and provided it to early humans. Prometheus is often blamed, in ancient sources, for his pivotal role in history. Likely, Robo was given this extra name to explicate his role as a time-traveler and his outright defiance of Mother Brain for sympathizing with humans. Mary Shelley's Frankenstien is subtitled "The Modern Prometheus". This adds a new dimension to the man-made qualities of Robo and the struggle encountered as he develops human identity. In the Japanese version, Robo has a unique speech; he speaks with bits of katakana in his sayings and has trouble with pronunciations. Most of the robots talk in all katakana, with the exception of Johnny. In the FMV of the PlayStation and DS releases, Robo is the only playable character without a special ending. This can be attributed to his role as the Prometheus Circuit in Chrono Cross. In Ravenstone Mine, an expansion to the Facebook game Ravenwood Fair, you can buy a "protector" called R-68Y. This is basically a plagiarised Robo. Robo's theme sounds similar to the 80's singer Rick Astley's song "Never Gonna Give You Up". Fans have said that whenever they hear Robo's theme it is as if they are being "Roborolled" instead of "Rickrolled". When the party travels to the Last Village Commons with Magus, his pet Cat, Alfador notices him and starts following him around. Magus has a statue of himself in the Cathedral, and Medina Village. Although, after Magus has been defeated, the statue is now Ozzie. But after Ozzie's death, there is no statue at all. When fighting Queen Zeal, if Magus is in your party, his battle theme plays instead of boss theme. During the side quest at Cyrus' grave, if Magus is in your party, he will look away and cover himself with his cape as Frog's Masamune is shining powerful in mid-air. While Magus has never really been seen to have any happy emotion, if you go to the dancing part at the Millennial Fair and choose the laughing button, Magus will laugh. The name "Magus" is a Persian term historically used to denote followers of the ancient Persian religion Mazdaism and/or its prophet Zoroaster. "Magi" is the Latin transliteration of the Persian term "Magus". The word "Magus" is the singular form of the word "magi", a Latin word (itself derived from the Persian word "Magus") serving as the root of the English equivalents "mage," "magic," and "magician." Magus' Japanese name Maō translates roughly to "demon king" and is more clearly identified as a title rather than a name. The name "Janus" (a Germanic name pronounced with a "Y" instead of a "J") stems from the Roman deity of gateways and beginnings. 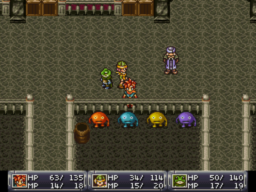 Magus' identity as Janus does transition into his identity as Magus and then the Prophet, which seems to be supported by the etymology for his birthed name; Gates also play large roles in the story of Chrono Trigger. The Roman deity Janus also inspired the name of the month of January, which also matches Magus' frigid personality. His HP when fought as a boss is 6666, a reference to the number of the beast in Christianity (666), adding to Magus' association with darkness and evil. 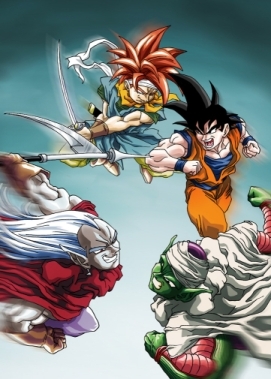 If Magus is renamed, the new name is reflected in bestiary entries 180 and 195 (battles in Fiendlord's Keep and North Cape [New Game +]) In the official artwork by Akira Toriyama, Magus is wearing a red cloak, but his in-game sprite is blue/violet. Magus also seems to use his cape as a makeshift blanket when sleeping. Magus is the only character in the game to never temporarily leave the party. In addition to the Persian prophet Zoroaster, certain aspects of Magus' character also appears to parallel the Islamic prophet Muhammad, who founded the religion of Islam in the early 600s AD and established the first Islamic state in the city of Medina (which Medina Village is named after) in 622. The conflict between the Mystics and Guardians also appears to parallel the Muslim-Christian conflicts of the Middle Ages, such as the Arab–Byzantine wars and the Crusades. Caspar, Melchior, and Balthasar are named after the magi who brought gifts of gold, frankincense and myrrh to the infant Jesus in Christian tradition. Cyrus and his fellow knights refer to themselves as "The Knights of the Square Table," an allusion to King Arthur and The Knights of the Round Table. And indeed, the tables in the mess halls of Guardia Castle, where the knights are fed, in both Present and the Middle Ages, are square. The pun only appeared in SNES versions of the game. It has been argued on "who" or "what" this entity is. The Earth itself is a very viable candidate for being the entity as it would feel at rest once Lavos is destroyed, as it would no longer be in danger. The Earth would also be able to create the gates on itself; and Robo was reflecting on this while he was re-growing the forest. The entity could also just be that, an entity similar to that of a God. Nobuo Uematsu appears in the Dream Team ending as Norstein Bekkler. Vicks and Wedge, from the Guessing Game, are allusions to Biggs and Wedge from the Final Fantasy series, who in turn are shout-outs to the two pilots from Star Wars Ep. IV. The laugh heard upon entering the tent is also Kefka Pallazo's laugh from Final Fantasy VI. The name Schala comes from the Arabic name, Salah, meaning virtuous. A prominent prophet in Islamic tradition bears this name. Her Japanese name, Sara, means Princess in Hebrew. A running trend in the Enlightened Ones is the color of their clothing: purple. Especially documented in Schala, Janus, and Alfador (in this case, his fur). In human color psychology, purple is also associated with royalty and nobility (stemming from classical antiquity when Tyrian purple was only affordable to the elites), which lends explanation to this trend. Alfador's Japanese name seems to be Alphard, the brightest star in the constellation Hydra. The name comes from Arabic and translates to “solitary one”. This is appropriate for Janus, but is also indicative of Alfador's refusal to show affection to anyone other than Janus. In Chrono Cross, the character Guile's Japanese name is Alf. Because Guile was originally intended to be Magus, it is likely that this name alludes to his former pet, Alfador. Azala is likely a portmanteau of "A" and "Zilla". Similar phonetically to Azriel, the Reptite Queen could be named after the Angel of Death who bears that name. Sometimes when Dalton himself doesn't want to fight, he summons an enemy called the Golem. Dalton is one of the few characters to 'break the fourth wall' when he yells "Stop the music!" before riding the modified Epoch for the first time. The music changes from "Chrono Trigger" to "Critical Moment", to Dalton's satisfaction. In Japanese, the Queen's name translates to Zeal, but is pronounced as "Jiru". During the Han Dynasty in China, Jiru were the male bed companions of Gaozu of Han. Additionally, the word Zeal means to pursue something passionately, as this Queen pursued immortality through Lavos, at the expense of her children, her associates, and her home. What denotes the A.C./D.C. separation in this game? What’s up with Crono’s father? The guy making Leene’s Bell in the past is really just looking for an excuse to not work. He lays down his hammer every time something happens. If the people in the future see your money as weird, what is their currency? Why does traveling with more than three people through time affect the portal. Why can’t you just travel one at a time and meet up at whatever time period. It’s not like the portals close or anything. Time flows evenly throughout the periods, kind of like in Bill and Ted’s Excellent Adventure. When in the Black Bird, party members cannot fight if they don’t have their equipment. Why can’t they use magic? I love it when Dalton breaks the fourth wall and asks for different music. Hey, c'mon now. It ain't easy here, but it's not THAT bad! Way to kick us while we're down! Good review, though. I love this game - my favorite RPG of all time, and my favorite game of all time. And the DS version takes everything that made the SNES classic the gem that it is, and makes it even better! 10/10 in my book, easily! I'm on my FiRsT eVeR pLaY tHrOuGh! I must say the reverence for this game is quite intimidating, but I can see the appeal. Especially regarding the music, it's quite exquisite. I've just given the magic sword to the talking frog-man so I guess I'm looking for some evil dude to slay... ? sounds like a good game..
Actually - I'm nearing the ending (again) right now.. Just have the black omen to do before facing the end. When I first got the DS version, I played through everything, including all the extra stuff that the ds version had and opened up all 13 endings. I wasn't really impressed with the extra stuff the DS offered but it was cool that it was there. Now when I play it, I just beat it normally, completing all the regular side quests that present themselves.. I am not familiar with Crono Cross enough to get all the references... in fact, i didn't quite get the new ending offered, even though I have played through 12hrs of Cross before giving up on slight bordom..
@GameDadGrant "Way to kick us while we're down." Did something happen in Detroit? I was gonna say Jersey at first, but then I remembered the recent devastation, so I refrained from that. I wanted to give it a 10, since the game itself is a 10 but, it just didn't go above and beyond to re-earn it, like I feel Ocarina of Time did. They tried a few things that worked, and some that didn't. Those new videos and the new ending were great, but the new quests were a shore and/or boring, in my opinion. @Super_Conzo I envy you, playing this for the first time. It's such an amazing experience that has been very influential on many games of the genre, and even outside of the genre. @Smerd I'm getting the urge to start of Chrono Trigger again, but I have a lot of games I've never played before just staring at me. This includes Radiant Historia, which I've heard I'll love if I love Chrono Trigger. I have never played Chrono Cross, but I do get the reference in that ending. I just beat Lord Magus. Maaaan it was down-to-the-wire tough. I don't think I'm as strong as I should be, I'm sweating bullets here! Reckon I've missed a lot of the upgrade capsules, can I still beat the game ok? @sirmastersephiroth Great review by the way, forgot to mention that. I didn't read the spoilers, obvs, but your enthusiasm leaps off the screen. You'll be fine. You may need to level up a bit later, though. And thank you! Just wait till you go on. The game really becomes better as you continue. Thanks for the review Sephiroth. I will be picking this up soon. It's still reasonably cheap! Thank you! You should. It's one of the most amazing games ever made. I went on a trip this weekend and I took it with me because I had the urge to restart it for the millionth time. I didn't have time to play it but I'll restart it pretty soon. @GameDadGrantI wanted to give it a 10, since the game itself is a 10 but, it just didn't go above and beyond to re-earn it, like I feel Ocarina of Time did. They tried a few things that worked, and some that didn't. Those new videos and the new ending were great, but the new quests were a shore and/or boring, in my opinion. Yeah, that's fair. I can dig it. In my opinion, this is the best version of my favorite game of all time, so it's an auto-10 in my eyes. But, that's just me. I can see where you're coming from, too. @GameDadGrant I have mixed feelings about that. My stance is that if you're just releasing it on the Virtual Console, therefore, it's the original game, I score it as I would have scored the original game on said console. However, if what you're doing is a port, remake, etc. on a newer console, then I expect new features that justify buying the "upgrade." And you run the chance of actually making the game worse. I'll give you another example, I actually prefer the PSP version of Final Fantasy IV over the DS version because you can choose the original music, and I prefer the the graphical style of the PSP version. Not only that, but they went above and beyond and included the After Years and an interlude to the game. Can't justify playing a version of Chrono Trigger where the music is compressed. Can't do it. @DrFinkelstein I saw that earlier. That was pretty cool. Actually, it sounds great. I'm very picky about sound when it comes to games. For example, I'd rather play the original version of Final Fantasy III (VI) on the SNES (VC) than on the GBA, which has more features, because of the sound quality. Oh and the PS1 version has horrible music, too. I'd rather play the Final Fantasy II on the SNES than the GBA or DS, once again, because of the soundtrack. The PSP version, though it has the same soundtrack as the DS version, somehow sounds better on the Vita. I guess the hardware helps. What I'm basically trying to say is, this game sounds great, even on the DS hardware. Who told you the music was compressed?